This Mexican shrimp recipe is a wonderful version of traditional shrimp scampi made with garlic and butter sauce. Here we have included some mild green chiles and fresh tomato for a nice flavor. The addition of jalapeno adds just a touch of heat for a little zing. Finished off with a sprinkle of cilantro and you will think you are dining on the coast of Mexico. Add olive oil to a saute pan over medium high heat. Add onion, jalapeno, green chile, and tomato and saute for 3 to 4 minutes. Turn off heat. In a large frying pan add butter and wine. Simmer for 5 minutes. Add garlic and cook for 4 more minutes. Now add the tomato, green chile mixture to the wine and butter pan. Continue cooking on medium high and mix ingredients well. Turn heat up to high and add the shrimp, stirring frequently for 3 minutes. Take the lemon and squeeze juice over all the shrimp. Cook shrimp until they turn pink and opaque. Don’t over cook the shrimp or they will get tough. Turn off heat and stir in the parsley/cilantro. 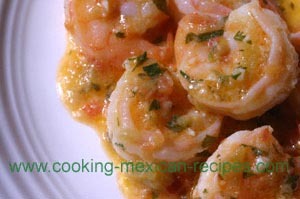 Serve this delicious Mexican shrimp recipe over rice.